In this post, we are going to go through a complete example of how to use the Angular Material Data Table. 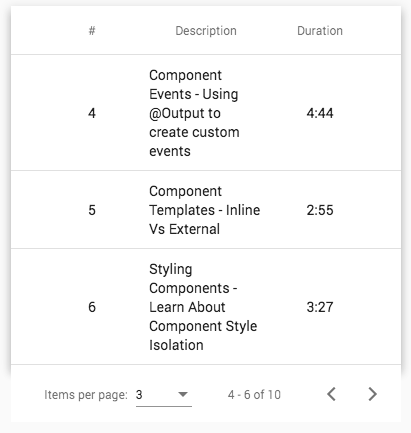 We are going to cover many of the most common use cases that revolve around the Angular Material Data Table component, such as: server-side pagination, sorting, and filtering. This is a step-by-step tutorial, so I invite you to code along as we are going to start with a simple initial scenario. We will then progressively add features one by one and explain everything along the way (including gotchas). We will learn in detail all about the reactive design principles involved in the design of the Angular Material Data Table and an Angular CDK Data Source. So without further ado, let's get started with our Material Data Table Guided Tour! The Material Data Table component is a generic component for displaying tabulated data. Although we can easily give it a Material Design look and feel, this is actually not mandatory. In fact, we can give the Angular Material Data table an alternative UI design if needed. To see that this is so, let's start by creating a Data Table where the table cells are just plain divs with no custom CSS applied. As we can see, this table defines 3 columns, each inside its own ng-container element. The ng-container element will NOT be rendered to the screen (see this post for more details), but it will provide an element for applying the matColumnDef directive. The matColumnDef directive uniquely identifies a given column with a key: seqNo, description or duration. Inside the ng-container element, we will have all the configuration for a given column. The Material Data Table has a series of auxiliary structural directives (applied using the *directiveName syntax) that allow us to mark certain template sections has having a certain role in the overall data table design. These directives always end with the Def postfix, and they are used to assign a role to a template section. The first two directives that we will cover are matHeaderCellDef and matCellDef. These two structural directives only identify which template elements have a given role (cell template, header template), but they do not attach any styling to those elements. For example, in this case, matCellDef and matHeaderCellDef are being applied to plain divs with no styling, so this is why this table does not have a Material design yet. This template is almost the same as the one we saw before, but now we are using the mat-header-cell and mat-cell components inside our column definition instead of plain divs. Notice that the table already has some data! We will get to the data source in a moment, right now let's continue exploring the rest of the template. The data cell template has access to the data that is being displayed. In this case, our data table is displaying a list of lessons, so the lesson object in each row is accessible via the let lesson syntax, and can be used in the template just like any component variable. The matHeaderRowDef directive also defines in which order the columns should be displayed. In our case, the directive expression is pointing to a component variable named displayedColumns. The values of this array are the column keys, which need to be identical to the names of the ng-container column sections (specified via the matColumnDef directive). Note: It's this array that determines the visual order of the columns! With mat-row, we also have a variable exported that we have named row, containing the data of a given data row, and we have to specify the columns property, which contains the order on which the data cells should be defined. As we can see the data for the first row is being printed to the console, as expected! But where is this data coming from? To answer that, let's then talk about the data source that is linked to this data table, and go over the Material Data Table reactive design. The data table that we have been presenting receives the data that it displays from a Data Source that implements an Observable-based API and follows common reactive design principles. This means for example that the data table component does not know where the data is coming from. The data could be coming for example from the backend, or from a client-side cache, but that is transparent to the Data table. The Data table simply subscribes to an Observable provided by the Data Source. When that Observable emits a new value, it will contain a list of lessons that then get's displayed in the data table. With this Observable-based API, not only the Data table does not know where the data is coming from, but the data table also does not know what triggered the arrival of new data. Again, the Data Table has no information about exactly which event caused new data to arrive, which allows the Data Table components and directives to focus only on displaying the data, and not fetching it. Let's then see how can we implement such a reactive data source. In this example, we will not be using the built-in MatTableDataSource because its designed for filtering, sorting and pagination of a client-side data array. 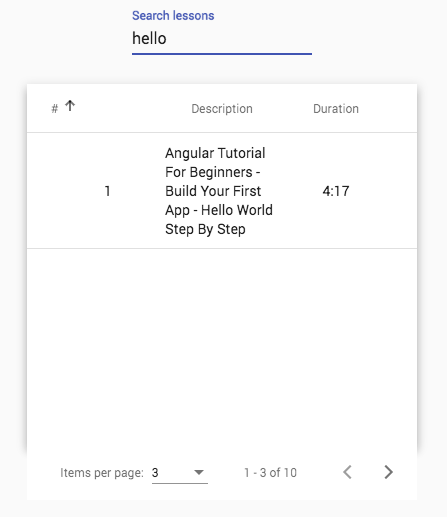 In our case, all the filtering, sorting and pagination will be happening on the server, so we will be building our own Angular CDK reactive data source from first principles. In order to fetch data from the backend, our custom Data Source is going to be using the LessonsService. This is a standard Observable-based stateless singleton service that is built internally using the Angular HTTP Client. As we can see, this service is completely stateless, and every method forwards calls to the backend using the HTTP client, and returns an Observable to the caller. Our REST API is available in URLs under the /api directory, and multiple services are available (here is the complete implementation). In this snippet, we are just showing the findLessons() method, that allows to obtain one filtered and sorted page of lessons data for a given course. With this arguments, the loadLessons() method will then build an HTTP GET call to the backend endpoint available at /api/lessons. As we can see, we are appending a series of HTTP query parameters to the GET URL using the HTTPParams fluent API. This loadLessons() method will be the basis of our Data Source, as it will allow us to cover the server pagination, sorting and filtering use cases. Has we can see, in order to create a Data Source we need to create a class that implements DataSource. This means that this class needs to implement a couple of methods: connect() and disconnect(). Note that these methods provide an argument which is a CollectionViewer, which provides an Observable that emits information about what data is being displayed (the start index and the end index). We would recommend for now not to focus so much on the CollectionViewer at this moment, but on something much more important for understanding the whole design: the return value of the connect() method. This method will be called once by the Data Table at table bootstrap time. The Data Table expects this method to return an Observable, and the values of that observable contain the data that the Data Table needs to display. In this case, this observable will emit a list of Lessons. As the user clicks on the paginator and changes to a new page, this observable will emit a new value with the new lessons page. We will implement this method by using a subject that is going to be invisible outside this class. That subject (the lessonsSubject) is going to be emitting the values retrieved from the backend. The lessonsSubject is a BehaviorSubject, which means its subscribers will always get its latest emitted value (or an initial value), even if they subscribed late (after the value was emitted). Using BehaviorSubject is a great way of writing code that works independently of the order that we use to perform asynchronous operations such as: calling the backend, binding the data table to the data source, etc. Now that we understand the reactive design of the data source, let's have a look at the complete final implementation and review it step-by-step. Let's start breaking down this code, we will start first with the implementation of the loading indicator. Because this Data Source class has a reactive design, let's implement the loading flag by exposing a boolean observable called loading$. This observable will emit as first value false (which is defined in the BehaviorSubject constructor), meaning that no data is loading initially. The loading$ observable is derived using asObservable() from a subject that is kept private to the data source class. The idea is that only this class knows when data is loading, so only this class can access the subject and emit new values for the loading flag. This method will need to return an Observable that emits the lessons data, but we don't want to expose the internal subject lessonsSubject directly. Exposing the subject would mean yielding control of when and what data gets emitted by the data source, and we want to avoid that. We want to ensure that only this class can emit values for the lessons data. So we are also going to return an Observable derived from lessonsSubject using the asObservable() method. This gives the data table (or any other subscriber) the ability to subscribe to the lessons data observable, without being able to emit values for that same observable. This method is called once by the data table at component destruction time. In this method, we are going to complete any observables that we have created internally in this class, in order to avoid memory leaks. We are going to complete both the lessonsSubject and the loadingSubject, which are then going to trigger the completion of any derived observables. The Data Source exposes this public method named loadLessons(). This method is going to be called in response to multiple user actions (pagination, sorting, filtering) to load a given data page. And with this last bit, we have completed the review of our custom Data Source! This version of the data source will support all our use cases: pagination, sorting and filtering. As we can see, the design is all about providing data transparently to the Data Table using an Observable-based API. Let's now see how we can take this Data Source and plug it into the Data Table. And with this "glue" component in place, we now have a working Data Table that displays server data! The problem is that this initial example is always loading only the first page of data, with a page size of 3 and with no search criteria. 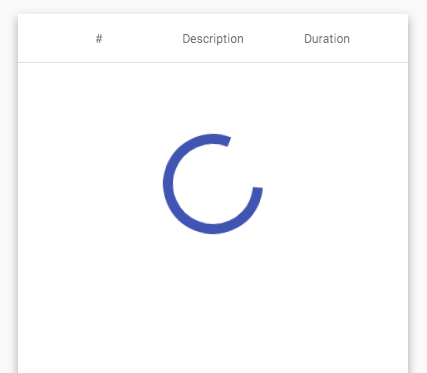 Let's use this example as a starting point, and starting adding: a loading indicator, pagination, sorting, and filtering. We will also be using the loading indicator when transitioning between two data pages using pagination, sorting or filtering. The Material Paginator component that we will be using is a generic paginator that comes with an Observable-based API. This paginator could be used to paginate anything, and it's not specifically linked to the Data Table. For example, on a Master-Detail component setup, we could use this paginator to navigate between two detail elements. As we can see, there is nothing in the template linking the paginator with either the Data Source or the Data Table - that connection will be done at the level of the CourseComponent. The paginator only needs to know how many total items are being paginated (via the length property), in order to know how many total pages there are! Its based on that information (plus the current page index) that the paginator will enable or disable the navigation buttons. In order to pass that information to the paginator, we are using the lessonsCount property of a new course object. Let's start with the course object: as we can see this object is available at component construction time via the router. This data object was retrieved from the backend at router navigation time using a router Data Resolver (see an example here). This is a very common design, that ensures that the target navigation screen already has some pre-fetched data ready to display. We are also loading the first page of data directly in this method (on line 20). How is the Paginator linked to the Data Source? We are using the AfterViewInit lifecycle hook because we need to make sure that the paginator component queried via @ViewChild is already available. The paginator also has an Observable-based API, and it exposes a page Observable. This observable will emit a new value every time that the user clicks on the paginator navigation buttons or the page size dropdown. So in order to load new pages in response to a pagination event, all we have to do is to subscribe to this observable, and in response to a pagination event, we are going to make a call to the Data Source loadLessons() method, by calling loadLessonsPage(). In that call to loadLessons(), we are going to pass to the Data Source what page index we would like to load, and what page size, and that information is taken directly from the paginator. Why have we used the tap() operator? We could also have done the call to the data source from inside a subscribe() handler, but in this case, we have implemented that call using the pipeable version of the RxJs do operator called tap. Let's now continue to add more features to our example, let's add another very commonly needed feature: sortable table headers. In order to add sortable headers to our Data Table, we will need to annotate it with the matSort directive. In this case, we will make only one column in the table sortable, the seqNo column. This is the sort configuration for the whole data table, but we also need to identify exactly what table headers are sortable! In our case, only the seqNo column is sortable, so we are annotating the column header cell with the mat-sort-header directive. 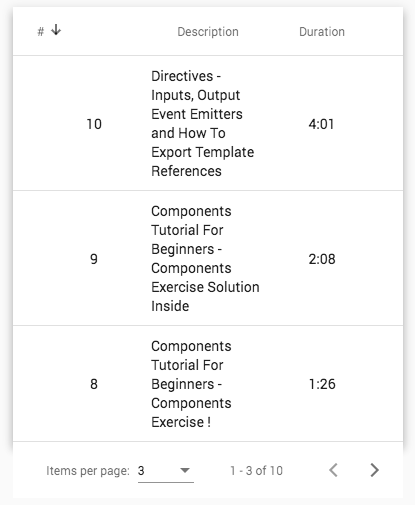 And this covers the template changes, let's now have a look at the changes we made to the CourseComponent in order to enable table header sorting. Just like the case of pagination, the sortable header will expose an Observable that emits values whenever the user clicks on the sortable column header. The sort direction of the seqNo column is now taken from the sort directive (injected via @ViewChild()) to the backend. Notice that after each sort we are also resetting the paginator, by forcing the first page of the sorted data to be displayed. At this point, we have server pagination and sorting in place. We are now ready to add the final major feature: server-side filtering. In order to implement server-side filtering, the first thing that we need to do is to add a search box to our template. As we can see, the only new part in this final template version is the mat-input-container, containing the Material Input box where the user types the search query. This input box follows a common pattern found in the Material library: The mat-input-container is wrapping a plain HTML input and projecting it. This gives us full access to all standard input properties including for example all the Accessibility-related properties. This also gives us compatibility with Angular Forms, as we can apply Form directives directly in the input HTML element. 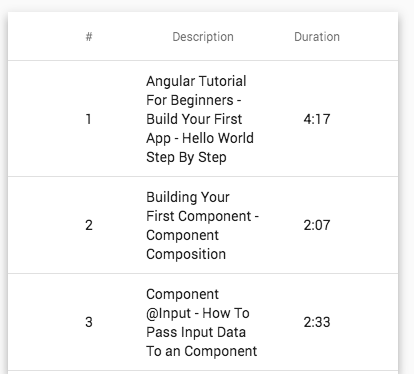 Read more about how to build a similar component in this post: Angular ng-content and Content Projection: The Complete Guide. Notice that there is not even an event handler attached to this input box ! Let's then have a look at the component and see how this works. Let's then focus on breaking down the server filtering part. We can see that we have injected a DOM reference to the <input> element using @ViewChild('input'). Notice that this time around, the injection mechanism gave us a reference to a DOM element and not to a component. What we are doing in this is snippet is: we are taking the search input box and we are creating an Observable using fromEvent. debounceTime(150): The user can type quite quickly in the input box, and that could trigger a lot of server requests. With this operator, we are limiting the amount of server requests emitted to a maximum of one every 150ms. And with these two operators in place, we can now trigger a page load by passing the query string, the page size and page index to the the Data Source via the tap() operator. And with this in place, we have completed our example! We now have a complete solution for how to implement an Angular Material Data Table with server-side pagination, sorting and filtering. Let's now quickly summarize what we have learned. This reactive design helps to ensure the loose coupling of the multiple elements involved, and provides a strong separation of concerns. A running example of the complete code is available here on this branch on Github, and it includes a small backend Express server that serves the data and does the server-side sorting/pagination/filtering. 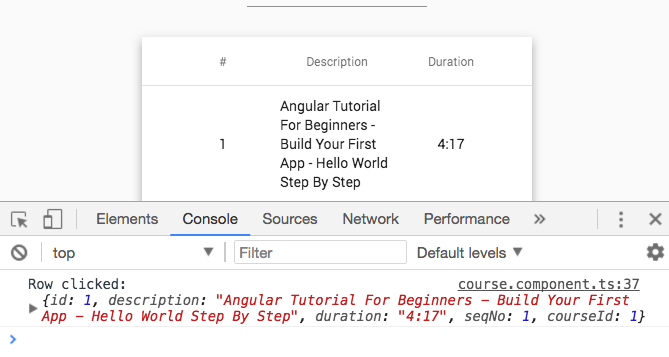 I hope that this post helps with getting started with the Angular Material Data Table and that you enjoyed it! If you have some questions or comments please let me know in the comments below and I will get back to you.